Ender's Game is probably my favorite science fiction book. Set a few hundred years from now, in the aftermath of an alien invasion that was repulsed, but only just barely, it follows the childhood schooling of a boy who was allowed to be born in the first place, despite the laws limiting population, in hopes that he would have what it took to lead the military space fleet to victory when the aliens return. Though it sounds pretty out there, the book is not so much into the physics of space travel or the biology of the aliens - there's no spaceship captain sleeping with exotic aliens or anything. Instead, it's about the development and personal struggles of a genius boy taken from his parents in early elementary school and thrown into a school for prepubescent military geniuses whose education is centered around a zero-G laser tag game. I'm not really sure what makes this so good. I think it's because I identify with Ender. And I don't think it's because I'm a genius, so much as the way the book is written it makes you feel like you are a genius like Ender, and that you are living through it with him. 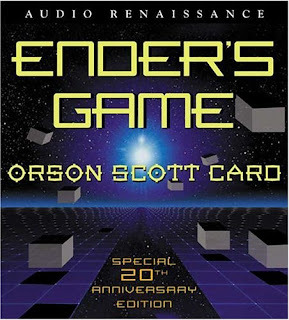 And there's a lot of tension and fear in the book - can Ender save humanity from destruction? Can he save himself from murderous jealous fellow students? stuff like that. I really like it. Call me crazy. The audiobook is read by several people, depending on whose perspective the story is being told from at the time. All the readers do just fine. It's a good production. No need for cheesy sound effects to embellish it. This is not a book, though, that I would let my pre-teen kids read, as ambitious as they are about reading. There's a lot of bad language in it, and a lot of locker-room type situations, what with a fight in the showers, and prepubescent machismo in the dorms and stuff. I don't feel like it necessarily detracts from the story, but I want my kids to have a little more maturity before they can swallow it and enjoy the story. Call it PG-13 I guess. Overall, 10 out of 10. Excellent read, excellent audiobook.